What attracted Native Americans and Europeans to Long Island’s south shore was the abundant opportunities offered by the land and sea. Milburn Creek was once within the domain of the Meroke Indians, who left mounds of clamshells along its banks. Ancient shell middens, an archeological feature, have also been discovered near Cedar Creek. Rockaway Indians fished and hunted on Long Beach Island, before selling the area in 1643 to colonists who harvested salt hay and fished there. Dutch and English settlers began cultivating land on the south shore during the 17th century. English Captain John Seaman purchased an area of what is now Seaford in the Town of Hempstead. Edward Raynor obtained land that later became Freeport, named such because of the lack of cargo fees for colonial shippers. The Dutch purchased property that would eventually become the Town of Oyster Bay. When the English seized the whole of Long Island from the Dutch at the end of the 17th century, the settlers were granted a patent to establish Oyster Bay. During the 18th and 19th centuries, colonists benefited from the plentiful resources on Long Island’s south shore. Major Thomas Jones built a whaling station on Jones Beach Island during the 1700s. During the 1800s, Hempstead became a vital trading post. James H. Doxsee established a clam processing plant on the south shore in 1865 that was so successful it nearly depleted the clam stocks by 1900. Oystering became Freeport’s economic staple. Austin Corbin, president of the Long Island Railroad built the Long Beach Hotel and provided rail service, attracting hundreds of thousands of summer visitors. In 1889, Phineas T. Barnum bought land in Island Park that became the neighborhood of Barnum Island, to be the winter home for his traveling circus. By the end of the 19th century, wetland filling on Freeport’s low-lying and marshy southern rim had created new home sites, and with a system of canals more firmly in place, the village was incorporated in 1892. In 1906, architect and entrepreneur William H. Reynolds, the developer of Coney Island’s Dreamland, set about making Long Beach a planned Mediterranean-style resort by the sea. Reynolds Channel was dug to widen the waterway for steamboats and seaplane landings. Prior to the railroad, all development occurred along the waterways. Bay houses became a staple of the Nassau County coastal landscape between 1700 and 1900. 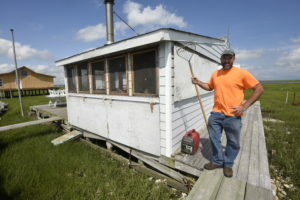 These small hand built structures on stilts crafted by Baymen on marsh islands hoping to reap a rich harvest from clam, oyster and scallop beds that flourished there, and taking advantage of the location to eel, fish, and shoot ducks and geese. As the 20th-century progressed, an influential boat-building industry gained momentum. Commercial, recreational, and military vessels, including trawlers, Coast Guard and Navy ships, flat-bottomed garvey and duck boats were Freeport specialties. New York State officially opened Jones Beach in 1929. With the construction of the Wantagh and Meadowbrook Parkways connecting Jones Beach Island to Long Island, visitors arrived in droves. Increased suburbanization during the 1950s expanded development on the south shore, as many residents settled in the towns and villages, but worked in New York City. Bay houses numbered 300 by 1965, as wealthier New Yorkers began to build them as weekend getaways. Unfortunately, after Hurricane Sandy only 15 bay houses remain in the western bays. The 20th Century not only brought development and progress, but also growing resource conservation awareness. The south shore of Long Island became more developed and simultaneously needed greater protection. But pollution from boats, land runoff and invasive plant species threatened the shore and wildlife. The lucrative oyster and clam trade became damaged by pollution. Several efforts at conservation were initiated. And the U.S. Fish and Wildlife Services named areas around Lido Beach priority wetlands. In 1993, concerned citizens pressed the New York State Legislature to enact the South Shore Estuary Reserve Act creating the South Shore Estuary Reserve and the Council to preserve and manage the unique and fragile estuary, which extends 75 miles from the New York City/Nassau County line to the Village of Southampton. Today, the south shore’s waterways are mainly used for recreation, though locals continue to capitalize on the abundance of shellfish and game fish in the bays. Nassau County is the busiest recreational motor boating region of New York State. Jones Beach is the most popular and heavily visited beach on the East Coast. The south shore bays offer residents and visitors unspoiled scenery, world-class fishing, plenty of birds and outstanding opportunities for water adventure.